You have decided to set up a personal Altar; you will need to take some things into consideration when you start. First you will need to decide if you would like to have it openly displayed, or if you would prefer to have it hidden in a discreet place. The goal is to find a place where you will feel the most comfortable and safe. Altars can vary in size and forms; you can have anything from a regular table, a nightstand or even a recovered tree stump. The altar does not need to be an elaborate set up, it only needs big enough to hold your Altar supplies in order to work with them with ease and comfort. Once your altar space has been chosen, next you will decide on an Altar Cloth. This cloth should have some reflection on who you are, what your beliefs are and be practical at the same time. Remember you are going to be burning candles, mixing herbs, using smudge sticks, and a number of other spiritual tools. There is no need to break the bank on your alter cloth, as in most cases it is there to protect your altar and will need to be replaced often. What should you have on you Altar? 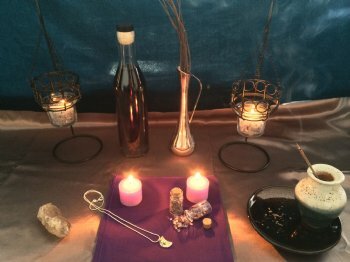 These are only some of the items that you should have included in your altar space. Of course there is a number of additional items not listed below that can be included, but for most part these are the common items for any personal Altar. Candles: A Ceremonial Candle. This is a general purpose candle used to begin and set the focus of your energy and protection. Orange: Cleansing; healing; harvest season; abundance. Purple/Violet: Spiritual energy; healing; advanced psychic abilities; peace and calm spiritual protection and healing, psychic ability, protective energy. The 4 elements: If you plan to perform spells at your altar in which you work with elemental forces, then you will need representations of these things on your altar. I have seen some people have 4 bowls represent the four elements; also you can have individual items represent each element. For example, a candle to represent fire; a bowl, seashell or chalice to represent water; salt, stones or soil can be representative of earth and to represent air, you can use a feather or simple incense. Crystals: These can be excellent energy conductors, and help connect to your workings. Different crystals and gems hold different energies. You may want to keep a variety of crystals in your altar cabinet for various rituals. A Mixing Bowl or Cauldron: This will be used to combine any ingredients you would need in your workings. Statues: Some people choose to have statues of the Matron Goddess, and Patron God. If this is your path and you do not have these statues yet, you can also find candles that represent both. For the Goddess you can choose the color that you believe represents her best (e.g. green or silver or white) and for the God (e.g. yellow or gold). Again this is all personal preference, and you can choose to have your Altar set up to your own personal belief system. · Athame and/or the wand. · Grimoire or Book of Shadows. Other Magickal items you can have in your altar are; a bell to ring in the beginning and the end of your ritual or ceremony; a variety of herbs, dried plants and spices which can also be helpful depending on the ritual you are performing. Your altar is essentially your sacred space and should remain as such. The altar should be geared toward your own personal beliefs. This is a spiritual altar and you'll want to honor your beliefs and the Divine energies that are present in you space. If you follow Celtic practices, then your altar should represent that Celtic feeling. Same goes if you work with specific Gods or Goddesses', having the right statue that you align with is a great way to maintain your space. If any of our friends have any further suggestions, please leave a comment either here in our blog or on our Facebook page, we always welcome your input. After all the craft is a constant learning curve and what works for some doesn’t always work for all. I use remnants from the fabric store to make my Alter cloths. A piece big enough to fit over the top (allow seem allowance), I let about 2" overlap on sides, this is a good cheap way to make what you want and the scraps are inexpensive. I have a nice old cabinet with storage for my supplies underneath. My alter faces East and I use a pentacle made from twigs to decorate the top,If you have a dollar store nearby this is a good source for stocking candles as well as other items you may need. Blessed Be. The altar is a very personal thing. Every object is placed in a precise way following your own intuition and a little logic. I had more than one in my bedroom. It may not be a good idea to have it where you sleep. It would definitely be best in a small room dedicated to meditation and spell casting. -- I know, I dont have one of those either.